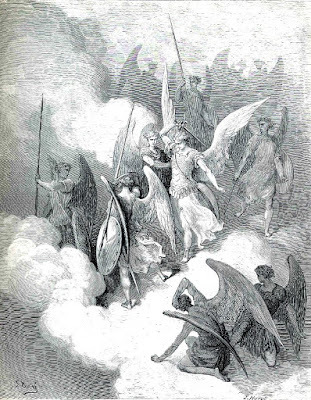 One Eternal Day: "Trophies rather than testimonies"
Near the middle of Milton’s Paradise Lost, the archangel Raphael describes for Adam — who has not yet fallen, not yet disobeyed — the War in Heaven between Satan’s rebellious angels and those who have remained faithful to God. Throughout this portion of the poem a major figure is a loyal angel named Abdiel. It is his task, or privilege, to cast the first blow against Satan himself: his “noble stroke” causes Satan to stagger backwards and fall to one knee, which terrifies and enrages the great rebel’s followers. This happens as Abdiel expected; he’s not afraid of Satan, and knows that even the king of the rebels cannot match his strength, since rebellion has already sapped some of the greatness and power of the one once known as Lucifer. It seems to me that this politics of long joy is the one thing needful for the Christian cultural critic, as for a warring angel like Abdiel or a poetic polemicist like Milton. Perhaps the chief problem with the “culture wars” paradigm that governs so much Christian action and reflection, in the North American context anyway, is that it encourages us to think in terms of trophies rather than testimonies. It tempts us to think too much about whether we’re winning or losing, and too little about the only thing we ultimately control, which is the firmness of our own resolve. If the culture warrior would prefer not to be governed by Stanley Fish, or even by John Milton, maybe Koheleth provides an acceptable model: “In the morning sow your seed, and at evening withhold not your hand, for you do not know which will prosper, this or that, or whether both alike will be good” (Ecclesiastes 11:6).